Launched in 1978, the A-1 – the top of Canon’s A line of cameras, (also composed of the AE-1, AE-1 Program, AV-1, AT-1 and AL-1), was the first single lens reflex camera to offer three auto exposure modes (Shutter Priority, Aperture Priority and Program) in addition to the Manual mode. The A-1 accepts all Canon FD lenses and (stopped down) can also work with older FL lenses. A feature loaded and intimidating camera with a very “muscular” design, it was in fact well thought and easy to use. It sold in the millions. The AX-5 was the top of Fujica’s new line of bayonet mount 35mm film cameras, launched in 1979 to replace the ST605, ST705 and AZ-1 screw mount cameras. Coming one year after the Canon A-1, the AX-5 offers almost the same feature set, but in a smaller and much more restrained package. Fujica AX-5 (with Tamron 28mm f/2.5 lens). The AX-5 accepted all Fujica’s newly launched “X-Fujinon” bayonet lenses but could only access the Shutter Priority and Program auto exposure modes when paired with X-Fujinon “DM” lenses (which have the “A” position on the aperture ring). 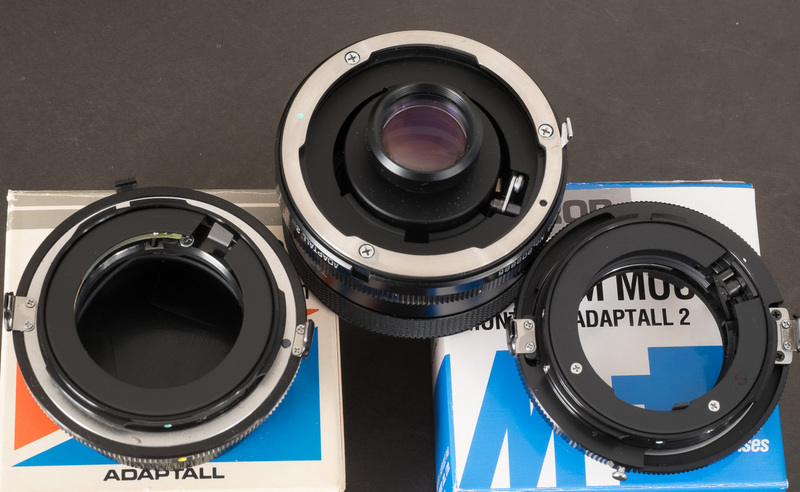 Lesser camera models (the AX-3 and the STX-1) were usually bundled with “FM” lenses, deprived of the “A” setting. the “A” line of SLRs from Canon was a best seller (probably more than 10 million units were sold), the A-1 representing approximately 1/4th of the total volume. The cameras were widely distributed and competition between retailers played its role: the prices were very similar from one store to the other one, and moderate when compared to the AX-5. Fuji’s retailer network was narrower than Canon’s, and the AX-5 was the least successful model of Fujica’s “X” line. Retailers did not seem particularly interested in stocking or promoting it, and as a result it was significantly more expensive than the Canon A-1. Canon A-1 vs Fujica AX-5 – the Canon is bulky and looks “professional”. The Fujica’s design is a bit toned down. The AX-5 was available with a black or a silver finish, and is smaller and lighter than the A-1. It looks almost “feminine” next to the black-only and larger A-1, with its removable hand grip and its multitude of switches and levers. in both cameras, the shutter speed knob has been replaced with a control wheel and the selected shutter speed is shown on a disk, visible through a small window on the top plate. With the A-1, the aperture ring of the lens has to be set on the “A” position to operate in any of the automatic exposure modes (Shutter Priority, Aperture Priority and Program). There is a toggle switch on the front plate of the camera to chose between the Aperture Priority or the Shutter Priority and Program modes. When the photographer switches to Aperture Priority, the desired aperture is selected by rotating the control wheel, and displayed through the same small window on the top plate. To operate in Aperture Priority mode with the AX-5, one has to set the aperture ring of the lens on the desired value, and select the Auto Exposure position with the control wheel. To operate with Shutter Priority or Program modes, one has to set the lens on the “A” position, select the shutter speed (Shutter Priority) or a full Auto Exposure mode (understand Program) with the control wheel. .
On the AX-5, there are two positions on the control wheel for the Auto Exposure command: AE – the camera adjusts the exposure until to the last second, and AEL (auto-exposure lock): the camera will keep the exposure setting determined by the photographer as long as the shutter release button stays half pressed. Very convenient. The Canon A-1 has an exposure lock button on the left of the lens mount to the same effect. The commands of the AX-5 don’t feel as solid as the Canon’s (and the Fujica’s control wheel is too small and protected by a tiny push button lock – not pleasant to use). Fujica – strange barrel distortion when wearing glasses – noticeable but not really penalizing when shooting pictures. speed and aperture scales and LEDs intertwined on the left of viewfinder – legible but a bit confusing at the beginning. horizontal cloth – comparable – 1/1000 sec synchro at 1/60e. A-1 goes to 30sec, Fujica up to 2sec only. Canon – uses Canon FD lenses (or FL stopped down). Canon’s catalog of FD lenses was very wide and had something for all types of photographers – from amateurs looking for zooms, up to pros looking for the lens that will make “the” picture that will differentiate them from their competitors. Naturally, compatible lenses of all levels of quality were also available. Fujica X – Fuji’s catalog of lenses included 20 different models, primarily primes lenses from 17mm to 400 mm, and three zooms. The AX-5 could also use screw mount “universal” lenses with an adapter; most of the big vendors of third party lenses (Tamron, Makinon, Soligor, TOU, Komine…) manufactured lenses for the “X” mount, but if the scarcity of lenses today is any indication, anything other than the standard 50mm and the 135mm tele-objective sold in extremely low volumes. Fujica : reliability was questionable back then, with an electro-mecanic shutter release that did not age well at all (capacitor issues after a few years). Today, unless you’re only looking for a paper weight, only buy a camera tested by the seller, with fresh batteries. The batteries are of a very common type, and “not having a battery to test” is not a valid excuse. Canon A-1 – relatively easy to find – they were produced in huge numbers and have been reliable – there are still plenty of them waiting for you. Fujica AX-5 – difficult to find in good condition, in particular in the US. More abundant in Germany and central Europe, sometimes under a retailer’s label such as Porst (the AX-5 is the same camera as Porst’s CR-7). Because the market is so small, prices for models tested and in working order can go up to $150. Both cameras use the same 6v battery- still widely available today in alkaline, silver oxide and lithium variants. Silver Oxide is probably the best compromise. None of the cameras works without a battery – no shutter release, no film advance – lots of people must have believed that their camera was broken when it was just asking for a new battery. Canon: Abundant offer of great lenses at reasonable prices (Canon FD). Equally abundant offer of third party lenses, including in very exclusive brands like Angenieux. Fujica: The AX-5 was launched in parallel to a new line of lenses, and none were really successful on the marketplace. Today, it is difficult to find anything which is not a 50mm or a 135mm lens. When you can find them, original Fujica X-Fujinon lenses with the renown EBC coating are expensive. Wide angle lenses or fast zooms are even more scarce and reach Leica R or Contax price levels. For an active film photographer, it’s a no brainer – Canon A-1 cameras are abundant, lenses are easy to find and relatively cheap, and the A-1 is not inferior to the AX-5 in any significant way. The A-1 is the most satisfying pick in Canon’s “A” line, and the best choice in today’s comparison. Fuji is a respected brand in the photography business (their medium format cameras and their current digital offerings have a cult like following). But Fuji’s aura does not extend to the Fujica AX cameras, who have lived an obscure life. For the collector of anything Fuji, the AX-5 is an interesting challenge: finding one that works is not super easy, and buying lenses is outright difficult. For an active photographer, the Fujica AX-5 has good sides: the camera is perfectly usable, it is light and compact, and presents simple and logical commands – but it does not feel as solid as the A-1, and looks more like a souped-up mid level SLR than a true enthusiast or pro camera. And in any case, because of the scarcity of X-Fujinon lenses, – the real good ones have even become an object of speculation – none of the Fujica “X” cameras can be considered a reasonable choice for an active film photographer.